Recently I have published a number of posts about how to run CoffeeScript compiler on Ubuntu Linux, and on Windows (with Cygwin and without it). Actually, there are more to it. Look, for example at django-coffeescript python package. You can likely find more examples if you spend time searching. What it means for me is that I’m far from being alone in my interest in CoffeeScript. There is a substantial (and growing) momentum behind CoffeeScript. And this is very important. No matter how smart certain technology is, industry support is critical for its success. Seeing all those developments happening make me more confident in future of CoffeeScript and I will use it for my developments. I’m not going to explore myself any more ways to run CoffeeScript compiler. I have enough for my needs. I will explore other aspects of working with CoffeeScript in my future posts. RecentlyI have posted instructions on how to install Node.js and CoffeeScript on Windows using Cygwin. It results in fully-functional Node.js and CoffeeScript, but the process is rather cumbersome. There is another way to get CoffeeScript working on Windows suggested by alisay and briefly described here, which is based on usage of the experimental Windows version of Node.js. While the way is not recommended as default by both CoffeeScript author (Jeremy Ashkenas) and Node.js team, it works more or less for me. There are things (e.g. CoffeeScript –watch option) that don’t work, there are things (e.g. Cake build task) that I managed to make working after doing certain tweaks in CoffeeScript files. But if you need just basic function – compilation – it works fine as well as a number of other functions. Still, If you look for fully-functional Node.js as well, you need to install it over Cygwin as described in the previous post. So here is how to make CoffeeScript working on Windows in a simple way. Download Windows version of Node.js from here and download CoffeeScript from here (look for “Latest Version” link). Put node.exe file into any directory you find it appropriate (e.g. I have used c:\tools\node). Unzip CoffeeScript in any other directory (I have used c:\dev). Go to the directory where you put node.exe and create coffee.cmd file. Here C:\dev\jashkenas-coffee-script-1a652a9\bin\ is a path to coffee file which is located in bin directory of CoffeeScript dirstro. Substitute it with the actual path you have in your case. Add the folder where you put coffee.cmd to Windows PATH (see instructions here), restart your computer. This means you have installed CoffeeScript successfully and you can compile CoffeeScript files. However this does not mean that each and every option of CoffeeScript compiler works on Windows in this setup as well. For example, I could not make working –watch option (maybe you will be more lucky). If you see such output, it means you can run Cake. CreateProcessW: %1 is not a valid Win32 application. since there is no sudo command on Windows etc. Today we’ll be installing Node.js and CoffeeScript on Windows (I have described earlier how to do it on Ubuntu Linux). My Node.js installation routine is loosely based on this document. Here is one catch I have to explain first. A version of Node.js for Windows does exist . However it is described by its authors as experimental one and it is not recommended for running CoffeeScript compiler. What’s more, IMHO it will likely always lag behind Linux/Unix version of Node.js. The reason is following. Authors of Node.js aim at creating a very fast technology for networking applications. Naturally, to achieve this they rely heavily on low-level OS capabilities and they have chosen to use POSIX API for this purpose. POSIX stands for Portable Operating System Interface for Unix; all versions of UNIX and most versions of Linux implement it; Mac OS X is POSIX-compliant as well and as you can see here Ryan Dahl (“father” of Node.js) uses Mac laptop for development. There are other POSIX-compliant OS as e.g. AIX. However Microsoft decided not to make Windows POSIX-compliant. Yes, one can figure out how to do the same things (more or less) using Windows API, but still this requires major changes in the code. Maintaining two widely different code bases ( e.g. of Node.js) and evolving them in parallel is quite difficult and expensive. So do not count on “native” Windows version of Node.js, at least for now. [Update on Sep 27, 2011. If you just want to compile CoffeeScript on Windows and do not need latest and greatest Node.js for other purposes, you can do it in much simpler way than I describe below. See details here. But a lot of advance functions of CoffeeScript compiler won’t work or would require tweaking to make them working. If you want to use latest and greatest Node.js on Windows and/or fully functional CoffeeScript compiler and Cake build tool, follow the instructions below]. We’ll use an existing work around of the problem to install and to run POSIX version of Node.js on Windows. Obviously, Node.js is by far not the first application which face a problem due to Windows being not POSIX-compliant. There is Cygwin which is a combination of DLL providing emulation of POSIX API on Windows and a set of POSIX-compliant software like e.g. Bash shell etc. 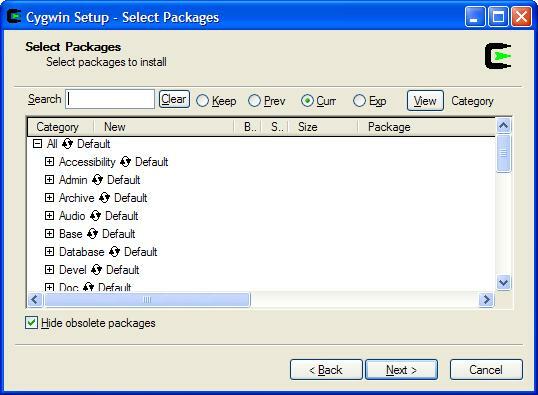 Being installed on Windows Cygwin provides a sort of POSIX environment for other applications that need it to run. So we’ll run Node.js on top of Cygwin. To do this we need to install Cygwin first. 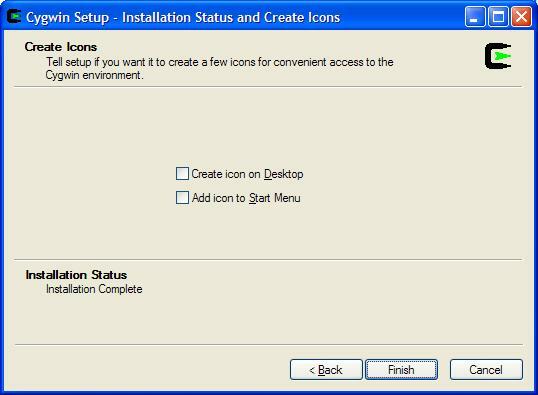 Here are original Cygwin installation instructions if you want to follow them. Otherwise just do what I describe. Download Cygwin setup.exe and run it. 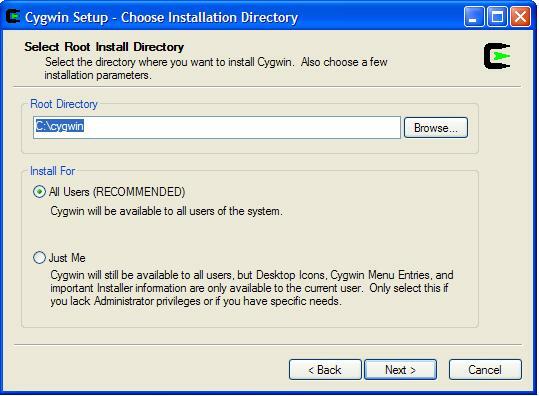 It launches Cygwin installation wizard. 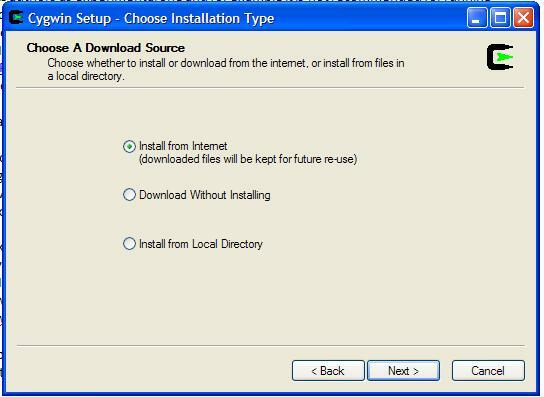 On the second screen select “Install from Internet”. 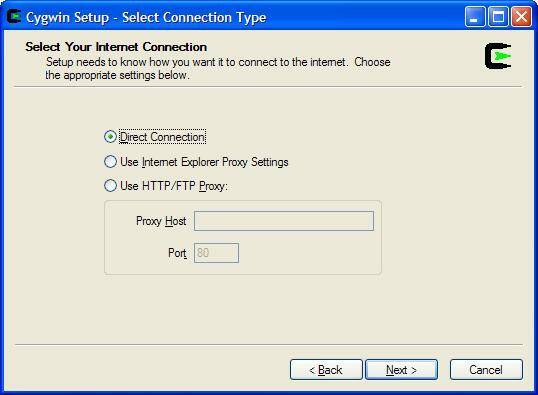 If you are doing this at home, you almost certainly don’t have a proxy, so select “Direct Connection”. If you are within LAN (e.g. 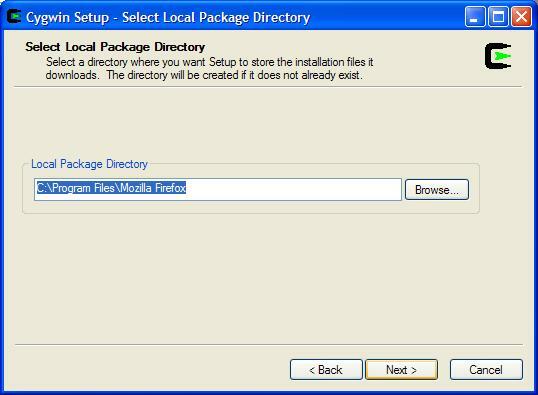 a corporate network), then you the most likely have a proxy and you can try “Use Internet Explorer Settings” or just enter proxy URL and port. Click “Next”. Expand “Python” section and select python. At this moment you can go and make coffee for yourself. The installation will take time to compete. Select both checkboxes and click “Finish”. Congratulations, we have installed Cygwin. This adds Google Public DNS servers to your Cygwin configuration. Re-start Cygwin terminal window. Type which gcc. If you see /usr/bin/gcc as a response, we are done with installing Cygwin. 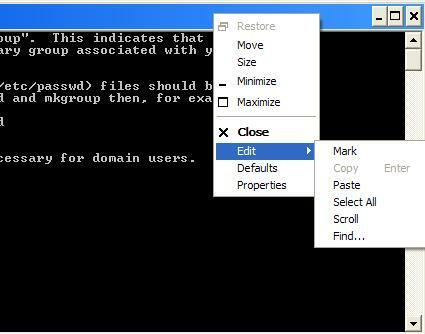 Click Paste and the text you have copied previously will be pasted in Cygwin window. This means the source directory name is node-v0.4.11 (nodejs is the directory you have created earlier). If the attempt failed, check whether you installed all additional Cygwin components I have mentioned above. For this just run Cygwin setup.exe and go through the steps described above. This won’t destroy your existing Cygwin, but it will add whatever you forgotten to add. Re-start Cygwin, and go to the source directory by typing cd ~/node-v0.4.11. Run the configuration command again. Now let’s verify whether Node.js works. Type node. You should see > as a prompt. Type 2+2. If the reply is 4, Node.js works. which means CoffeeScript has been installed. Congratulations! Node.js and CoffeeScript are installed and ready to be used. Advice on how to use CoffeeScript on Windows. The result of the compilation will be placed in the same folder where test.coffee is located. 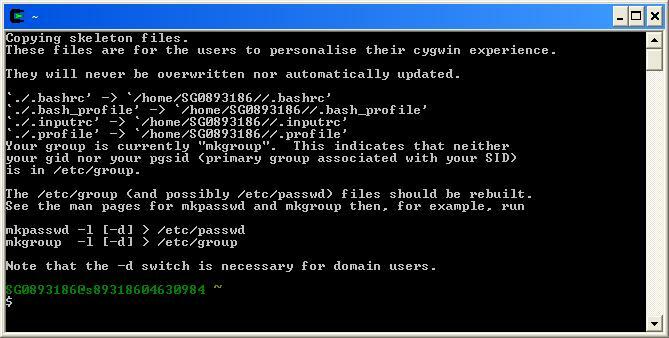 See more details on accessing Windows files from Cygwin here. I’m using Ubuntu 11.04 on my laptop and it has Node.js installation package available in one of its repositories. Unfortunately it is version 0.2.6 while today (Aug 22, 2011) the newest stable Node.js version is 0.4.11 and the difference seems to be too much to justify using the old one. So I will attempt to use an alternative installation method to get the latest version installed. Actually, there is just one alternative method available: simply to build it from source. That’s what we are going to do. I will be using these published instructions. I’m using Linux, so I should go directly to step 3 of the instructions. 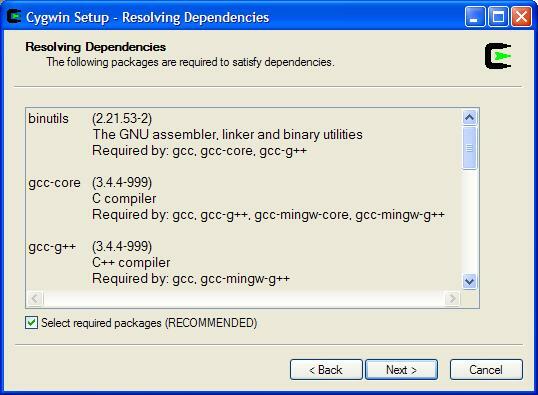 It suggests checking whether I have gcc (Gnu Compiler Collection) installed by typing which gcc in a terminal window. Well, I do have gcc in /usr/bin/gcc. If you don’t have it, you can install it using either Synaptic Package Manager (System->Administration-> Synaptic Package Manager) or apt. You should substitute the version of Node.js you are going to install and the directories that you want to use into the script. The URL pointing to the latest stable source could be found here. Create the file, set proper permissions on it (chmod 744 node-install.sh) and run it by typing ./ node-install.sh. Along the way the script will ask your permission to do cleaning. Answer “yes”. Execution of the script takes some time (around 10 minutes on my laptop), so be patient. At the end you should see “It worked” message. Now let’s test if Node.js works. Type node in the terminal window. It should show > as a prompt. Type 2+2. Node.js should return 4. This means you installed it right. Next post will be about installing Node.js and CoffeeScript on Windows.